The prices in this deal round up were accurate as of 2019-03-18 06:42 EST. The prices may have changed since then. 56% OFF 3M Ultrathon Insect Repellent Lotion, 2-Ounce: You can get this for only $6.99 here and it’s normally $15.99 at Amazon. 50% OFF Sony SACS9 10-Inch Active Subwoofer: You can get this for only $98.00 here and it’s normally $199.99 at Amazon. 59% OFF True Temper Forged Square Point Shovel – 2585500: You can get this for only $8.99 here and it’s normally $21.99 at Amazon. 65% OFF Pfaltzgraff Everyday Aria Red 16-Pc. Set, Service for 4: You can get this for only $37.99 here and it’s normally $110.00 at Macys. 62% OFF Arlo Lights – Smart Home Security Light | Wireless, Weather Resistant, Motion Sensor, Indoor/Outdoor, Multi-colored LED| 3 Light Kit (ALS1103) camera not included: You can get this for only $129.51 here and it’s normally $349.99 at Amazon. 76% OFF AQ Textiles York 4-Pc Queen Sheet Set, 600 Thread Count Cotton Blend, Created for Macy’s: You can get this for only $29.99 here and it’s normally $125.00 at Macys. 77% OFF Star Wars: X-Wing – Upsilon-class Shuttle: You can get this for only $9.11 here and it’s normally $39.95 at Amazon. 54% OFF TP-Link Deco Whole Home Mesh WiFi System Homecare Support, Seamless Roaming, Dynamic Backhaul, Adaptive Routing, Works with Amazon Alexa, Up to 5,500 sq. ft. Coverage (M5): You can get this for only $135.95 here and it’s normally $299.99 at Amazon. 44% OFF Disney – Disney Junior Vampirina Ghoul Girl Doll – Styles May Vary: You can get this for only $4.99 here and it’s normally $8.99 at Best Buy. 46% OFF DEWALT 20-Volt MAX Cordless Grease Gun with Bonus 20-Volt 5.0Ah Battery Pack and Charger: You can get this for only $199.00 here and it’s normally $369.00 at Home Depot. 41% OFF Westinghouse – 32″ Class – LED – 720p – Smart – HDTV: You can get this for only $99.99 here and it’s normally $169.99 at Best Buy. 48% OFF Nespresso Vertuo Evoluo Coffee and Espresso Machine by De’Longhi, Red: You can get this for only $101.99 here and it’s normally $199.00 at Amazon. 75% OFF Oatey 43796 Gasket for Tapping into Cast Iron Soil Pipe: You can get this for only $1.24 here and it’s normally $4.98 at Amazon. 50% OFF Quicken Deluxe 2019 – Mac|Windows: You can get this for only $24.99 here and it’s normally $49.99 at Best Buy. 52% OFF Chicago Blackhawks 20″ 8-Wheel Hardcase Spinner Carry-On – Black – No Size: You can get this for only $80.00 here and it’s normally $169.99 at Walmart. 52% OFF Denco NFL Oakland Raiders Carry-On Hard case Spinner Luggage, 20 x 13.5 x 9, Pink: You can get this for only $75.95 here and it’s normally $159.99 at Amazon. 45% OFF MUK LUKS Women’s Felicity Boot-White Fashion, Cream 6 Medium US: You can get this for only $31.60 here and it’s normally $57.58 at Amazon. 54% OFF Baxton Studio Mid-Century Masterpieces Love Seat, Brown: You can get this for only $211.99 here and it’s normally $467.50 at Amazon. 49% OFF Shark HV392 Flex DuoClean Corded Ultra-Light Vacuum .41 qts. Charcoal: You can get this for only $149.99 here and it’s normally $296.66 at Amazon. 69% OFF The Mummy (1999): You can get this for only $3.99 here and it’s normally $12.98 at Amazon. 41% OFF Aroma Housewares 14-Cup (Cooked) (7-Cup UNCOOKED) Pot Style Rice Cooker and Food Steamer (ARC-747-1NGR): You can get this for only $15.22 here and it’s normally $25.99 at Amazon. 50% OFF Sony SSCS5 3-Way 3-Driver Bookshelf Speaker System (Pair): You can get this for only $73.00 here and it’s normally $148.00 at Amazon. 69% OFF Energizer MAX 9V Alkaline Batteries, 1-Count: You can get this for only $1.22 here and it’s normally $4.06 at Amazon. 62% OFF TL Care 100% Natural Cotton Percale Crib Bed Skirt, Celery, Soft Breathable, for Boys and Girls: You can get this for only $9.35 here and it’s normally $24.99 at Amazon. 50% OFF Riedel – Bravissimo Red Wine Glass (4-Pack) – Clear: You can get this for only $19.99 here and it’s normally $39.99 at Best Buy. 47% OFF LucidSound LS31 Wireless Gaming Headset for Xbox One, PS4 – Wireless Surround Sound Headphones for Xbox One – Works Wired with Nintendo Switch, PC, Mac, Ipad, iOS, Android – Xbox One: You can get this for only $78.75 here and it’s normally $149.99 at Amazon. 69% OFF Women’s Stretch Fleece Warm Underwear Leggings: You can get this for only $3.00 here and it’s normally $9.96 at Walmart. 50% OFF Riedel – Bravissimo Longdrink Glass (4-Pack) – Clear: You can get this for only $19.99 here and it’s normally $39.99 at Best Buy. 50% OFF Riedel – Bravissimo White Wine Glass (4-Pack) – Clear: You can get this for only $19.99 here and it’s normally $39.99 at Best Buy. 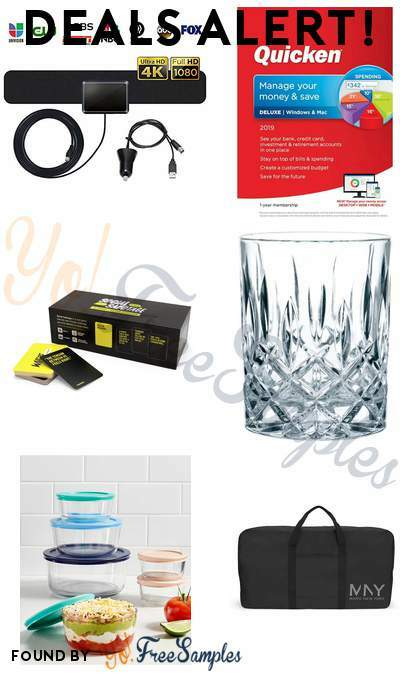 50% OFF Riedel – Bravissimo Double Old Fashioned Glass (4-Pack) – Clear: You can get this for only $19.99 here and it’s normally $39.99 at Best Buy. 74% OFF NBA 2K18 Legend Edition – Xbox One [Digital]: You can get this for only $25.99 here and it’s normally $99.99 at Best Buy. 72% OFF Catan Histories: Merchants of Europe: You can get this for only $15.21 here and it’s normally $54.99 at Amazon. 73% OFF QuickBooks Desktop Pro 2019 [PC Disc]: You can get this for only $79.00 here and it’s normally $299.99 at Amazon. 50% OFF Honeywell Thermawave Electric Heater, Black, HCE860BWM: You can get this for only $34.97 here and it’s normally $70.00 at Walmart. 75% OFF Marc New York Carry A Ton Duffel: You can get this for only $9.99 here and it’s normally $40.00 at Macys. 51% OFF Nike Men’s Tanjun SE Casual Sneakers from Finish Line: You can get this for only $33.75 here and it’s normally $69.99 at Macys. 52% OFF All-Clad Stainless Steel 7-Pc. Cookware Set, Created for Macy’s: You can get this for only $299.99 here and it’s normally $629.99 at Macys. 60% OFF Homedics CLOSEOUT! The Crash Pad Instant Folding Bed: You can get this for only $79.97 here and it’s normally $200.00 at Macys. 83% OFF Weatherproof Vintage Men’s Plaid Brushed Flannel Shirt: You can get this for only $9.16 here and it’s normally $55.00 at Macys. 48% OFF Philips – Viva Collection Analog Air Fryer – Black: You can get this for only $102.99 here and it’s normally $199.99 at Best Buy. 74% OFF Pro Chef Kitchen Tools Over The Door Hooks – 6 Coat Hooks Pegs – No Drill Towel Rack for Bathroom Storage Closet – Behind The Door Organizer Clothes Rack – Office Cubicle Shoe Handbag Purse Hanger: You can get this for only $12.87 here and it’s normally $49.98 at Amazon. 41% OFF CORSAIR K70 RGB MK.2 RAPIDFIRE Mechanical Gaming Keyboard – USB Passthrough & Media Controls – Fastest & Linear – Cherry MX Speed – RGB LED Backlit: You can get this for only $99.99 here and it’s normally $169.99 at Amazon. 61% OFF Crayola Model Magic Gooey Fun! Party Kit, Slime Supplies, Gift for Kids, Age 5, 6, 7, 8: You can get this for only $8.06 here and it’s normally $20.83 at Amazon. 44% OFF Winsome Wood 94844 Rochester Occasional Table Antique Walnut: You can get this for only $67.68 here and it’s normally $123.00 at Amazon. 47% OFF Hasbro Connect 4 Game: You can get this for only $6.80 here and it’s normally $12.99 at Amazon. 60% OFF COOWOO LED Edison 60W Equivalent Halogen Replacement Dimmable E26 Base Vintage Filament Pendant 2700K Warm White 6W Antique Commercial Island Light Bulbs with 600lm 6 Pack b, Count: You can get this for only $19.99 here and it’s normally $49.99 at Amazon. 49% OFF AmazonBasics Portable Driving Practice Golf Net, 7-Foot x 7-Foot: You can get this for only $43.34 here and it’s normally $84.99 at Amazon. 55% OFF Jabra Move Wireless Stereo Headphones – Black: You can get this for only $44.77 here and it’s normally $99.99 at Amazon. 41% OFF Wireless Charger, Anker 10W Qi-Certified Wireless Charging Pad, Compatible iPhone Xs Max/XR/XS/X/8/8Plus, 10W Fast-Charging Galaxy S10/S9/S9+/S8/S8+/Note 9 and More (No AC Adapter, 3ft Cable Included): You can get this for only $13.99 here and it’s normally $23.99 at Amazon. 79% OFF Social Sabotage: An Awkward Party Game by BuzzFeed: You can get this for only $5.00 here and it’s normally $24.97 at Walmart. 44% OFF Mainstays Infrared Oscillating Dish Heater, Black Finish, JHS-800H: You can get this for only $24.97 here and it’s normally $45.00 at Walmart. 83% OFF ONN Full-Motion Wall Mount for 10″- 50″ TVs with Tilt and Swivel Articulating Arm and HDMI Cable (UL Certified): You can get this for only $12.98 here and it’s normally $79.00 at Walmart. 67% OFF Mainstays Infrared Electric Cabinet Heater, Black/Grey, DF1515: You can get this for only $24.88 here and it’s normally $76.82 at Walmart. 60% OFF Don’t Step In It, Preschool Game for Kids Ages 4 and up: You can get this for only $7.99 here and it’s normally $19.99 at Walmart. 69% OFF Mainstays Infrared Quartz Cabinet Heater, Black, WH-96H3: You can get this for only $39.97 here and it’s normally $130.90 at Walmart. 60% OFF RCA 43″ Class 4K Ultra HD (2160P) LED TV (RTU4300): You can get this for only $179.99 here and it’s normally $449.99 at Walmart. 47% OFF Fox Hill Emma Lounge Chair, Multiple Colors: You can get this for only $104.00 here and it’s normally $199.00 at Walmart. 69% OFF RAD Cycle Products Pro Stand Plus Bicycle Adjustable Repair Stand: You can get this for only $39.76 here and it’s normally $129.95 at Walmart. 49% OFF Tommy Hilfiger Men’s Color Block Hooded Ski Coat, Created for Macy’s: You can get this for only $97.99 here and it’s normally $195.00 at Macys. 69% OFF Buffalo David Bitton Men’s Six-X Indigo Jeans: You can get this for only $29.93 here and it’s normally $99.00 at Macys. 60% OFF Columbia Men’s Eager Air 3-in-1 Omni-Shield Jacket: You can get this for only $88.00 here and it’s normally $220.00 at Macys. 60% OFF MICHAEL Michael Kors Whitney Polished Leather Top Handle Satchel: You can get this for only $116.93 here and it’s normally $298.00 at Macys. 60% OFF adidas Team Issue Hoodie: You can get this for only $21.93 here and it’s normally $55.00 at Macys. 77% OFF Van Heusen Flex Men’s Slim-Fit Suits: You can get this for only $89.99 here and it’s normally $395.00 at Macys. 66% OFF Weatherproof Vintage Cotton Merino Cashmere Crewneck Sweater: You can get this for only $23.43 here and it’s normally $70.00 at Macys. 68% OFF Calvin Klein Men’s Slim-Fit Stretch Plaid Dress Pants: You can get this for only $29.99 here and it’s normally $95.00 at Macys. 69% OFF Michael Kors Men’s Classic/Regular Fit Natural Stretch Navy Check Vested Wool Suit: You can get this for only $199.99 here and it’s normally $650.00 at Macys. 41% OFF Pyrex 12-Pc. Storage Set: You can get this for only $24.99 here and it’s normally $42.99 at Macys. 60% OFF Citizen Men’s Automatic Signature Grand Classic Stainless Steel Bracelet Watch 42mm NB0040-58A: You can get this for only $398.00 here and it’s normally $995.00 at Macys. 75% OFF AQ Textiles Essex StayFit 6-Pc Queen Sheet Set 1200 Thread Count, Created for Macy’s: You can get this for only $49.99 here and it’s normally $200.00 at Macys. 50% OFF Sony SSCS3 3-Way Floor-Standing Speaker (Single): You can get this for only $98.00 here and it’s normally $198.00 at Amazon.